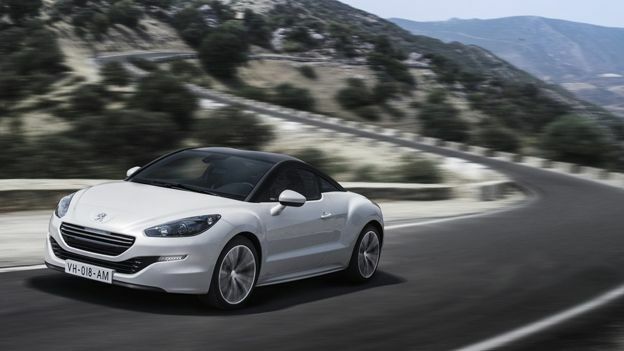 The Peugeot RCZ has been to the gym and it shows.. The Peugeot RCZ could not have arrived at a better time, styling for coupes had grown weary and even the refreshed Audi TT was beginning to lose its shine. So Peugeot stepped up to the mark and released a car that not only looked unlike anything anyone had seen in its class but also marked the real foundation of Peugeot's new design direction. Thankfully the 2013 RCZ GT THP200 is spearheading once again, while it may not look that different at first glance, the body has been given a serious re-working with the rear haunches now much more prominent while the headlights are now angled in such a way that the car appears much lower to the ground. Along with these changes, the RCZ now proudly sports a front grill which actually looks in proportion with the car, a long way from the original gaping mouths that adorned Peugeot's first set of new-look cars in 2011. The rear-window is still a showcase of design winning over logic with its double curve catching the eye of most passers by even today. Under the hood things are looking up as well. It's important to note that while this is Peugeot's top of the range RCZ it can't really be compared with Audi's equivalent – not only does the TT RS cost just under twice as much but it's also a LOT more powerful. Luckily by saving yourself around £18k you're not losing too much performance. The RCZ GT THP200 we tested comes with a 1.6 Petrol engine that pumps out 200bhp and will see you sprinting to 60 in a respectable 7.6 seconds. It's no hot hatch but then again the RCZ has been more about the journey than getting there faster than anyone else. Despite being a 2013 model the RCZ does not come with the new touchscreen interface that we first saw on the Peugeot 208 156THP. Instead Peugeot has gone for a much more solid 7-inch 800x480 display which rises out of the centre console. This can then be controlled from either the steering wheel or dashboard eliminating any distraction by moving your hands away from the wheel. The UI is simple but effective boasting Peugeot's own satnav and multimedia system, on the dashboard itself you get a secondary colour screen which then relays essential navigation information along with the usual mileage info. All of this sounds pretty run of the mill and you'd be right, where things get interesting however is when you decide to upgrade and get the custom-designed JBL sound system. The RCZ already comes with Arkamys audio processing as standard, which means that the car will intelligently move the sound around the vehicle depending on speed, acceleration and outside noise making sure everything feels balanced. The JBL high-end option then adds to that 2 medium Hi-fi tweeters, 2 Hi-fi woofers and 2 coaxial elliptical 6x9 Hi-fi speakers in the rear. All of this comes together via the 240W digital amp which is located in the boot. The output is impressive to say the least. Bass is deep and aggressive while the high-notes almost hit the point of being too shrill but thankfully this can always be solved by hitting down on the accelerator, hard. Joking aside this is a genuinely brilliant sound system and one that would have even the most stoic of car park-based customisers gently nodding his head in sage approval. With the tech out of the way it's important to point out that over half of your attention will be directed to the fact you're moving along tarmac at considerable speed. Luckily the RCZ performs admirably in this area as well. The steering is much tighter than you'd expect for such a big car while the suspension is significantly softer than that found on Peugeot's smaller cars. This isn't a bad thing: the THP156 made you feel like you were driving a very fast steamroller around a road network made exclusively with cobbles. Instead what you have is a good balance that still lets you feel like you have some communication with the road whilst making sure your spine doesn't the brunt of any potholes. Throw all this together and what you're left with is a very comfortable, long-range tourer that offers a genuinely thrilling driving experience not just because of the way the car feels from A to B but also thanks to the soundtrack you'll have playing while you do it.